This innovative turnkey system was specially designed for businesses interested in cost effectively producing their own Gel Ice Packs and Hot/Cold Compresses for in-house use or resale. This innovative turnkey system was specially designed for businesses interested in cost effectively producing their own Gel Ice Packs and Hot/Cold Compresses for in-house use or resale. The TEMTRO™ Gel Pack Production System can be used to make gel packs for about 8 cents and result in over 7,000% savings, convenience, and flexibility. The TEMTRO™ Gel Pack Production System is essentially ‘plug and play’. You can be in production literally within one hour. To get started, simply connect the machine to a water supply using a garden hose, plug in the machine to a 120 volt power supply, fill the hopper with TEMTRO™ Dry Gel and you are ready to make gel packs. It’s as easy as that! The TEMTRO™ Gel Production System has a capacity to make 150 to 200 gel packs/hour with a single operator or around 48,000 gel packs/month operating for 8 hours a day. Furthermore, this system was designed to conserve space and only requires about 8 square feet to setup. The TEMTRO™ Gel Pack Production System can be used for making attractive clear or Gel Ice Packs that stay cooler longer than ice without the watery mess. The Gel Ice Packs can be effectively used in lunch boxes, coolers and shipping containers to refrigerate perishables longer than ice. The TEMTRO™ Gel Pack Production System can also be used to make therapeutic Hot/Cold Compresses and Therapy Bands. These products can be effectively used to treat sprains, strains, cuts and contusions and reducing swelling, inflammation, pain, muscle spasms, aches, and hemorrhaging. Using the TEMTRO™ Gel Pack Production System, you can make a wide variety of gel ice packs and hot/cold compresses for only pennies each. In addition, you will eliminate your freight costs and reduce your storage space. 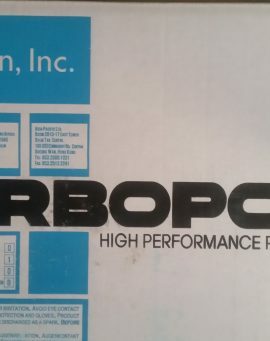 Use of this system should save you up to 7,950%. The TEMTRO™ Gel Pack Production System is available in the Standard and Premium models. 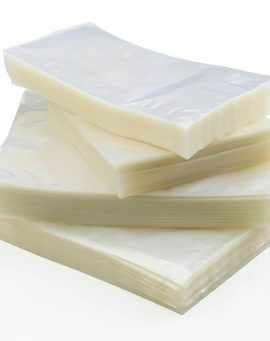 The Standard model is suitable for making standard Gel Ice Packs with a variety of sizes and weights. If you require the capability to add color to your gel packs and/or make Flexible Gel Ice Packs, the Premium TEMTRO™ Gel Pack Production System is required. As an added incentive for purchasing any of our TEMTRO™ Gel Pack Production Systems your future purchases of Dry Gel will be discounted depending on volume by to save you even more money. All it takes to produce a gel pack are a few easy steps……. 1) Fill the hopper on the top of the machine with TEMTRO™ Dry Gel Crystals. 2) Connect to a water source using a regular garden hose. 3) Plug the machine into a 110 volts outlet. (We have an adapter for 220 volt outlets). 4) Turn the on/off switch to the on position. 5) Take a plastic bag and hold the open end under the spouts. 6) The machine will automatically dispense the required amount of water and dry gel crystals. 7) Seal the bag with a heat sealer . It’s as simple as that! 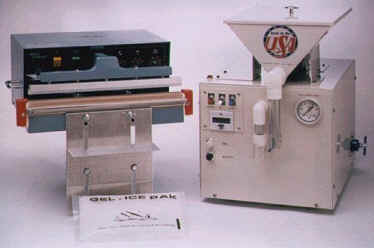 With this machine you have the capability to produce around 200 gel packs/hour with a single operator. Many users typically produce over 2,000 one pound gel packs a day. How Does the TEMTRO™ Gel Ice Pack Production Machine Work? When the plastic bag is placed around the dispensing spout, a microswitch will automatically be activated. The microswitch triggers the timers and sets the machine in motion. The bag is filled with the correct amount of water and gel. When the machine stops, the bag is pulled away and sealed with a heat sealer. What size Gel Ice Packs can the TEMTRO™ Gel Ice Pack Production System make? 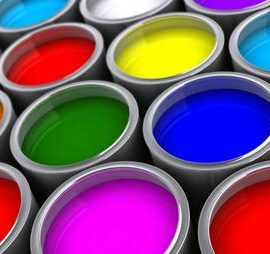 Bag Size – The smallest width is 4″ and the maximum 12″ which is limited by the sealer buy we can provide a 18″ or 24″ wide sealer at an additional cost. 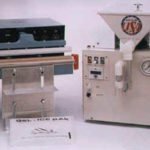 Weight – The lowest weight is 4 oz and the maximum with a single dispensing action is around 5 pounds but much larger bags can be made by activating the dispensing more then once.